Sterling, IL March 2017: Sterling Systems & Controls, Inc. is pleased to announce that lot tracking is available with all of its batching control systems and, like all other aspects of the Sterling Systems & Controls offering, can be customized to meet the needs of the customer. 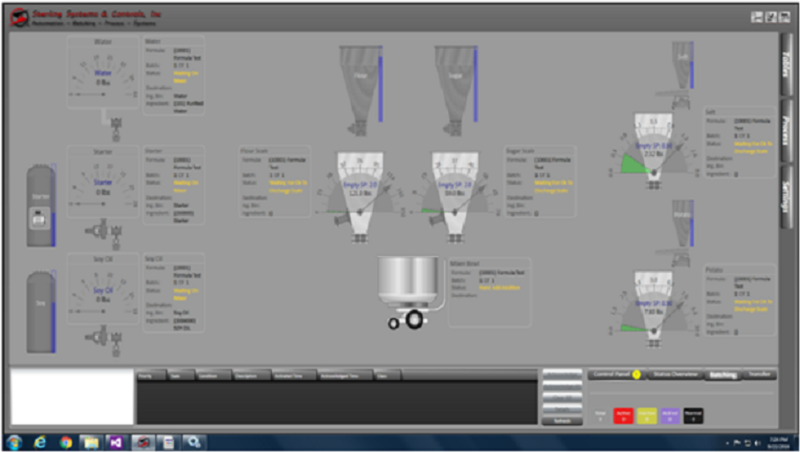 Total Traceability and Validation can be provided on all manual hand-add or automatic batching control systems. Lot tracking and total traceability is a requirement in many industries, particularly in the food industry where there are large commercial sale for human consumption and in the agriculture industry where chickens, cattle, and hogs are mass fed or the feed is commercially sold. Many facilities and feed mills may get audited every few months, and in the animal feed industry the mill is required to present documentation or reports to the FDA showing their traceability. These reports come from the Sterling Systems & Controls feed mill batching control system. Sterling Systems & Controls customized batching control systems can include as little or as much tracking and traceability as the customer wants to implement. It will depend on the customer’s ability to fund and implement the tracking system. Several inventory strategies are available. FIFO is the most common. Operators will be required to enter a valid lot number before the system will proceed. This data entry can be done by scanning a barcode, manual data entry and by RFID. The Batching Control System will include an Ingredient Lot Table. This contains records for each unique lot number of each ingredient. New records are added to this table when the ingredient is received. Sterling Systems & Controls, Inc. has 40+ years of experience providing efficient solutions for process equipment, batching, micro, minor and bulk weighing, bag unloading systems, as well as plant automation. Sterling’s designs utilize the latest technology to provide specialized data management, raw material management, along with production data tracking. Sterling’s systems can optionally be interfaced by remote users using our unique WebCentral™ supervisory control application. For more information contact Sterling Systems & Controls at 1-815-625-0852 sci@sterlingcontrols.com, and at www.sterlingcontrols.com.